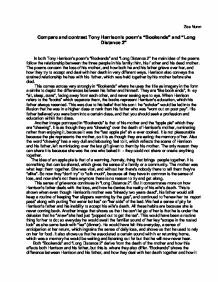 Zoe Nunn Compare and contrast Tony Harrison's poem's "Bookends" and "Long Distance 2" In both Tony Harrison's poem's "Bookends" and "Long Distance 2" the main idea of the poems follow the relationship between the three people in his family: him, his father and his dead mother. The poems concern the loss of his mother, and how both he and his father grieve over her, and how they try to accept and deal with her death in very different ways. Harrison also conveys the strained relationship he has with his father, which was held together by his mother before she died. 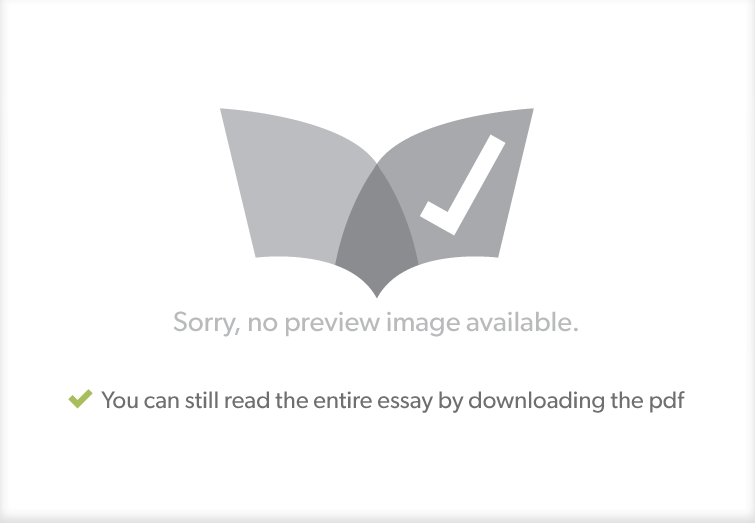 This comes across very strongly in "Bookends" where he uses the title as imagery in the form a simile to depict the differences between his father and himself. They are "like book ends", they "sit, sleep, stare", facing away from each other, and never seeing eye to eye. When Harrison refers to the "books" which separate them, the books represent Harrison's education, which his father always resented. This was due to his belief that his son the "scholar" would be led into the illusion that he was in a higher class or rank than his father who was "worn out on poor pay". His father believed you were born into a certain class, and that you should seek a profession and education within that class. ...read more. But "Long Distance 2" concentrates much more on the effects of her death on the father two years later. He is still "raw" over the loss of his wife, and two years has done nothing to ease the pain. The structure and rhythm of "Bookends" and "Long Distance 2" is irregular and awkward at times. I think Harrison intended this so as to emphasis the sense of her sudden death and the irregularity and instability of their lives afterwards. "Bookends" has 8 verses and 16 lines, with a continuation of rhyming couplets until verse 7. It has a simple structure, which is interrupted at the end very abruptly. Line seven summarises the whole poem without any explanation. It's rhythm and rhyme are completely different to the rest of the poem. It is very powerful, and is directed by Harrison at his father as a statement, showing exactly how much this loss has affected him. "Your life's all shattered into smithereens", it has long sounds and syllables, which drag on, unlike the short abrupt and explosive monosyllables in the first 6 verses. Harrison uses vowel sounds to create a long and continuous movement along with many long "Ss" and "Ls" to make this line stand out. It continues the sense that life is never going to be the same again, that his father has no hope at patching it all together, because it's "shattered" like shards of glass that have been smashed into tiny pieces. ...read more. Many of the other words in "Long Distance 2", "bed", "dad", "drop" and "popped", all share the ending of a deep "D". The sound is blunt and short, which connects with monosyllabic sounds, and the irreversible definiteness of death. There is a very strong connection between this sound and the meaning of the poem. "Disconnected" sums up both poems, but it is used in the last verse of "Long Distance 2", to explain that Harrison's father is disconnected with reality; he may as well be "disconnected" or "dead" himself. He is disconnected from his wife; from real life; and from the fact that his wife is not coming back. And what is mostly presented in both poems is that father and son are also disconnected. The phone at Harrison's parents is disconnected, and Harrison admits he is somewhat disconnected. This word has the same effect as "dead" with the double "D" at the beginning and end of the word. It has a long "N" sound in the middle, giving the word a negative quality, similar to the word "sullen" with the long "N' sound at the end rather than in the middle of the word. You can separate the syllables in 'dis | con | nec | ted', giving the word a rhythm of its own. It connects with many of the other letters and sounds in the poem (consonance), and is in some ways the most powerfully expressive word in the poem. ...read more. This student written piece of work is one of many that can be found in our GCSE Other Poets section. Many animals will crouch and wait before attacking so this supports the idea of the beast and the animal. In stanza two the poet introduces the first physical description of what Birkenau was like. In this stanza the physical description is introduced and an important technique for the poet in this stanza is personification. Possible he also lives without friends, maybe he hasn't been able to stay in contact with anyone because of his ideas of life, and the wish of being independent. Perhaps, he now regrets that he trew all the happiness and security back in school away to live by his ideas. You can see this in each and every line of the poem, she is still clearly disturbed by her past life and what she did and her children. She writes ?I have heard voices of the wind the voices of the Dim? (children). equal to men but to do so she suffered greatly. It also represents the price paid for women?s rights. The language and style of this poem is both strikingly powerful and memorable. The idea of power and the roots of feminine empowerment are clearly fascinating to the poet. Analysis of &amp;quot;End of shift&amp;quot; by Desmond Sim. This gives the reader the idea that as the persona is narrating, he is panting in between the lines and his pace of narration significantly slows down. Thus, the reader himself feels the exhuastion and breathlessness that the persona feels without the persona directly stating how he feels.